Daphne sat in her room brushing her hair. She kept each stroke of the brush slow and deliberate, taking care as she teased out the tangles and knots. She wanted her actions to be more violent, to fit her mood, but taking out her frustration on her hair would do more harm than good. Besides, she was being silly. Daphne was part of the skaa rebellion, dedicated to free the skaa from oppression and heal the final empire. Someone had to work in the brothel to cover the movements of the rebellion cell hidden within, and both her spying and her work at changing the perceptions of the nobility were important. Plus, because Daphne working in the brothel meant a different girl didn't have to. What she was doing here as important. Then why do I feel so angry? Lately, it seemed like she was angry with everything and everyone. Tura, her patrons, the other members of the rebellion. Even Valerre was starting to wear on her at times. Daphne didn't let her frustration show, of course. Just because she was in a foul mood didn't mean she had to spread it. The others were doing their jobs the best they knew how. They were all working to a common purpose, and if Daphne had to swallow her frustrations to do her part, she would a thousand times over. The rebellion was the skaa's only hope for the future, and she was just a whore. Daphne set her brush down with an over-exaggerated gentleness, proving to herself she was in control. She imagined the satisfying smack that would result from slamming the brush down onto her dresser or using it to shatter her mirror. Both actions were futile and would cause more trouble than relief. She would not let her emotions rule her. As always, the rebellion came first. That brought her back to why she was angry. In the rebellion, she was doing more for the cause than ever before. She'd expected to feel satisfied and proud of her work for once in her life. Instead, more than ever, she felt like she wasn't doing enough. No matter what Tura and the others said, they didn't seem to be making a difference in the brothel. All they did was spy on the nobles and hide the occasional traveling rebel. Other cells were supposedly planning raids and attacking keeps while Daphne played around and whispered sweet nothings into noblemens' ears. Skaa girls continued to be raped and killed and skaa children continued to starve to death in the streets, and nothing Daphne did seemed to be making any difference! I need to blow off some steam, she realized. If she continued to bottle up her feelings, the would be likely to come out at the worst possible moment. When she was with her clients she needed to be composed, in control, and always on guard. She couldn't afford to slip up. Valerre always said she didn't take enough time for herself; perhaps he had a point. Rising without really thinking about what she was doing, Daphne began to look through her closet. She didn't have any real exercise clothes, so she settled for a loose airy skirt and blouse that would allow her maximum mobility and settled a similarly constructed robe over top. She made her way to the room Tura had set aside for the rebel fighters who stayed in the cell. The room was too small to be called a training facility, but any larger would make it seem ostentatious and suspect. Sometimes she liked to try her hand at dancing when it was empty, and today she thought that would be just the thing to put a stop to her bad temper. When she opened the door, she found it was occupied. After a quick study, she identified the man within and recalled his name. Daphne always made a point to learn people's names. It never took much effort, and could go a long way in establishing connections. "Master Trevelan. I'm sorry to disturb you. I'll come back later." Most pewterarms made the mistake of confusing raw strength with power. They built up their muscles until they were little more than hulking brutes with all the subtlety of a koloss, too easily identifiable for what they were. A man or woman like that could have their uses, but there was a point at which all that muscle simply weighed you down and limited your movement, even with the unnatural speed given by pewter. Most of them couldn't so much as touch their own toes. Trev knew that power wasn't all about strength. It was strength combined with speed and precision for explosive force, and he could not rely only on pewter for that. Like any thug, he had to train his body, but he focused both on strength and flexibility, working on movements rather than building up muscle groups. He had just spent a good two hours training, and now he was sitting against the wall for a rest and a little water. He had positioned himself to keep both doors to the room in view, the main entrance and the hidden side-door as well, so that he could not be taken by surprise. It gave him a moment for thought as well. Here in this cell, it was all too easy to let himself go to seed. Ignas had given him little to do, and so Trev had to find ways to keep himself busy. He trained the other skaa rebels under his command, trained himself, tried to forge them into a cohesive unit and prepare them all for...what? For nothing, it seemed sometimes. They were not often called on, and when they were, it was for small things. All he heard were whispers and rumours of what was going on in Luthadel, nobles' pillow talk that filtered throughout the brothel. What had happened at the Casuana ball, though, that was more than rumours. The rebels had finally made a real strike against the Final Empire. And Trev hadn't been there. Instead he was here in the rebel brothel, working as a glorified bouncer. "Sure, it's worth something," he said quietly to the small, slinking creature that came up to him now for a scratch, "but it doesn't feel like much. I could have been there for the assault on Casuana. I would be of use in a cell like that. Here, I'm doing nothing, Ferret...only watching things pass me by. What is Ignas playing at?" This was always the way of things in a crew, though, whether a thieving crew or the Rebellion. Here, it was even more important that one arm did not know what the other was doing. If they lost one cell, then the others would still be safe. He knew that perfectly well, and that was why he hadn't questioned Ignas' decision. Still, the question remained in his own mind, and he could not really help turning it over. When the sound of the door opening broke into his thoughts, Trev was on his feet in a half a second, before it had fully swung open. He relaxed as he recognized the woman who came in, though. Daphne, one of the prostitutes. He did not know her on a personal level, but he knew who she was; he kept himself aware of the currents in the hierarchy of the brothel. Daphne was a leader, although he doubted most of those around her were consciously aware of how they deferred to her. If anything ever went wrong and there was a raid on the cell, Daphne would be one of the people he could count on to keep the others calm, and guide some of them to safety. "No, it's alright. You're not disturbing me. Daphne, right? Anything I can do for you?" he asked. Edited by Comatose, 27 January 2016 - 04:26 AM. Daphne nodded, slightly impressed. Most rebels didn't take the time to get to know the girls who worked in the brothel. "Yes that's me." His question made her blush slightly. Now she must look foolish, coming to a training room in a dress hoping to childishly get rid of her frustrations through exercise. She should be able to get rid of her problems on her own by now, shouldn't she? "It's nothing," she said, running her fingers through her hair and tucking it behind her ears. She'd forgotten to bring something to tie it back. "I was just hoping to use the room. If you're busy, I can just wait until you are done." Arms folded, Trev leaned back against the wall, studying Daphne and wondering what she was here in the training room for. Nothing was obviously not the right answer. For one thing, although her skirt was not exactly practical, she was not dressed in the alluring clothing that she would usually wear. She had blushed at the question, as well. That made him wonder if she was she looking for someone specific here - a tryst with one of his men, perhaps? Or was she here to use the room for its intended purpose? To use the room, as it turned out. Was she ashamed of that? Trev could see no reason to be. "I'm not busy," he answered, "just enjoying a little quiet time." He knelt to the ground and snapped his fingers. "Ferret. Come here." The small creature scurried back to him from his exploration around the room and up his arm, to settle in on Trev's shoulder, before Trev rose to his feet again. "I can leave, if you want. Or I can help you." He shrugged. "I've got the time on my hands." Daphne couldn't help but be startled when she noticed the ferret. "How did you... nevermind." She cleared her throat, trying to regain some composure. "I was just thinking of doing some exercises. Nothing you'd be interested in, I'm sure. I'm sure your training regimen is far more expansive." Daphne looked down at her feet and stopped herself. She had just as much right to use the room as he did. Why should she be ashamed of her exercises? True, they probably could not compare to his fighter training, but then again, she wasn't a fighter. She did important work for the rebellion and had no reason to feel inadequate. Then why do I? That, Daphne realized, was the reason for her frustration. No matter what she did, it didn't feel like she was accomplishing anything. Whatever difference she was making in her work never seemed to amount to much. The Final Empire was an unchangeable giant, and fighting it made her feel helpless and insignificant. Daphne hated feeling helpless. Slowly, Daphne stepped into the room, trying to take command of the situation. "I think I'll be fine on my own. Thank-you very much for the offer though. I appreciate it." 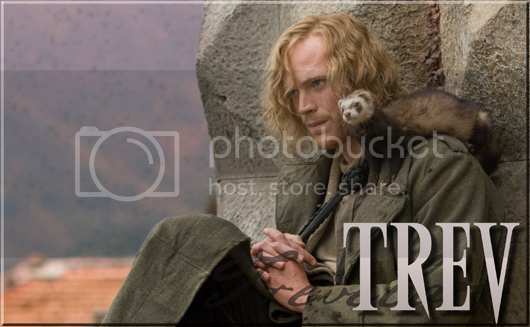 Ferret twitched his whiskers curiously at her from Trev's shoulder, and he reached up and scratched behind the thing's ears. He considered letting the creature go inspect her, as Ferret clearly wanted to do. The animal could be surprisingly good at defusing tension sometimes, and Daphne still seemed nervous, almost ashamed of herself. She deflected his questions in a self-deprecating tone. Nothing he'd be interested in, she said, then mentioned his regimen, as if it somehow made hers unimportant. Whatever her reasons, though, she wanted to be alone. Trev could understand that, and so he prepared to leave her to herself as she wished. "It helps keep the mind a little clearer, doesn't it?" he asked as he picked up the short staff he had been practicing with earlier. "Sometimes everything starts to close in, and I have to do something before it gets too quiet or it feels like I'll lose it." "If you ever do want someone to practice with," he added, pausing as he was about to pass her, "you can ask me, or any of my crew. None of them would mind." Edited by Comatose, 27 January 2016 - 04:27 AM. Daphne nodded, grateful that Trevelan was finally moving on. As he picked of the short staff, however, she stopped. Even in so casual an action, every movement was graceful, coordinated, and precise. Trevelan was obviously a capable fighter who took his training seriously. Dangerous was the word that came to mind as she watched him move towards the exit. Each step had the grace of a stalking predator, and he moved as smoothly as the ferret on his shoulder. Every movement and expenditure of energy was for a purpose, nothing was wasted. Daphne made a decision. She wanted to be more useful, more vital to the rebellion, and Trevelan had given her the chance. She couldn't afford to let self-consciousness or pride get in her way. "Wait," she called. "Please. I actually wouldn't mind some help." Her eyes strayed to the staff, and then back up to Trevelan's eyes. This was a blunt man; and honest one. Manipulation would only make him lose respect for her. Those cold blue eyes were the type that demanded the truth. "I'm tired of feeling useless," she admitted. "Nothing I do here seems to make any difference. If you'd teach me, I'd like to learn to fight. So I can defend myself and others." Trev stopped when Daphne called out to him, turning to look back at her. So she had changed her mind after all? He considered her for a long moment as she spoke her mind. She was thin, but not unhealthy; she looked like she might have a little muscle underneath the loose clothing. She had a direct and intelligent gaze, now that she was meeting his eyes, and held herself with a noticeable physical confidence. It surprised him that she'd say she felt useless, though. Of course, Trev was not privy to most of the vital information the men and women who worked in the brothel were able to uncover. His work didn't require that, and it was better if he only knew what he needed. But he knew the brothel cell was having at least some success, or else it would not be maintained; Ignas would not waste resources on something that was actually useless. It was odd how she had echoed what he had been thinking only a few minutes ago. What he still felt, even though he knew rationally that as long as the cell was safe, he should be grateful for every moment of peace. Trev's very inactivity was a sign of the brothel's success. Even knowing that, though, did not make it easier to be left out of the action, and only hear of Ignas's strikes secondhand. He understood what Daphne felt more than he would say. "Then I'll show you how," he answered. "I'm glad you want to learn; I wish more of the workers would do the same. I have limited manpower, and the more people who know how to defend themselves, the better." After considering her for a few moments' pause, he added, "But you should know that you are not useless. You are a strength and a support to the others around you. They look up to you, and listen when you speak. What you do for morale is important even on an everyday basis. It would be vital in a crisis, where they would rely on you even more; if you are calm, they will also be calm." "Never discount the worth of a Smoker, either. Without copper in this cell, all of us would be found very quickly, and we'd be dead. I'd call that making a difference." Edited by Comatose, 27 January 2016 - 04:28 AM. So direct. Daphne looked down, slightly uncomfortable with his praise. She hadn't been aware Trevelan knew anything about her besides her name. The rebels who worked outside of the brothel were usually discouraged from interacting too much with those who worked inside of it, in the interest of keeping the flow of information to a minimum. He spoke plainly, answering exactly what was asked while leaving nothing vague or undefined. And, he'd somehow managed to peg her as a leader within the brothel. Daphne wasn't sure if that made her proud or uncomfortable. When he tried to assuage her concerns, she felt her mouth harden unintentionally. "I didn't ask for your pity, Master Trevelan," she kept her voice quiet, to avoid sounding angry or irrational. She didn't want to challenge or offend him, but she felt the point had to be made. "I know what we are doing here, and my role. If I didn't, I wouldn't be here." Daphne returned her gaze to his eyes. "I know our purpose is an important one. It's just sometimes it feels like we're not getting anywhere. What's the point of all this spying and raiding if a pretty skaa girl can't live to marry and have a family because some noble takes a liking to her and little boys go hungry when their mothers are stolen from them. We live in a world where those who live on the streets are considered fortunate because they are free, and it doesn't seem like that's ever going to change." She sighed, wrapping an arm around herself and looking down. "I'm sorry. I didn't mean to start preaching. I've been trying so hard to keep up a strong face for the others, it's starting to get to me I guess." Daphne shook her head to clear it. "I don't know why I'm telling you all of this. We should really start training." "I wasn't offering pity," he answered mildly after she rejected his words, her face tightening with a little anger, "just the truth as I see it. We'll change all of that, Daphne. One day, we'll bring the Final Empire down, and change the world. Build something better. But right now we only have a few weapons at our disposal. If the rebellion attacked openly, we would be crushed; we have to strike from the shadows to cause as much fear and confusion as we can. There's not much satisfaction in that, but we are doing something." Daphne had one arm wrapped about her body, as if she were hugging herself for comfort. Trev thought it might help her to feel a little less alone. She was the kind of woman who drew strength from giving it to others. So Trev said what had been on his mind all day as his eyes refocused on hers. "Don't apologize. It's a good thing you did talk to me. I needed to hear it today, needed to know I'm not the only one who finds it hard sometimes. The quiet means we're all doing our jobs properly; the Inquisition hasn't stumbled across us. But I want to strike out, I want to fight on the front lines, and here I am instead, waiting to be called on; half the time I'm not doing anything at all, not even gathering information. It's not easy to wait until you're needed." He smiled. "But today you've brought me something to do. So, shall we?" Daphne smiled softly. Trev was right. It was nice to know someone else shared her feelings. It made her feel less alone to talk to someone who thought about things the way she did. True, she had Valerre, but he was so wrapped up in his own life it was hard for him to understand how taxing taking on the troubles of others could be. If she had told him what she told Trev, he likely would have told some joke and began talking of running away together. If you were happy where you were, you stayed, and if not, you ran. It was that simple for Valerre. Daphne wished she could say the same for herself. Nonetheless, she was grateful Valerre chose to stay with her. She didn't know if she could bear to lose him again. "Yes," she said, her tone brightening slightly. She relaxed her posture and did a quick survey of the room. Her eyes flicked back to Trev. What did he expect her to do? Did he think she had some groundwork? Was she supposed to put on some display of how much she knew? Daphne certainly hoped not. She felt like she'd been embarrassed enough times for one day. "I don't really know what I'm doing," she said slowly. "At all. So, perhaps it's best if you decided how we should begin." Trev had been right; it brought a small smile to her face, and her body language changed with her emotion. She was no longer standing in that defensive, closed-off posture; she'd opened up a little. That was much better. He wanted her to work with him. "Starting out is simple. You never want to go straight into a practice; you want to warm up and stretch, first. If you dance at all," she likely did, as she looked fit and trim, "it is like that. Get your blood moving, and then loosen your body, before you try to perform." He crossed to the corner and tossed her a length of rope, picking up a second one himself. "Skipping rope works well, since we don't have the room to run in here." Daphne raised an eyebrow as Trev reached for a length of rope. The exercise was a simple one, and far more up her alley than she was expecting. Her concern was more for the spectacle she would make jumping up and down with a man in the room. When she was with her patrons it was her job to be the subject of their oggling. She rather not do it in her free time. She didn't think Trevelan had realized the potential for awkwardness in the scenario he had suggested. He certainly didn't seem like that kind of man. Likely, he didn't realize the exhibitionism that a woman jumping rope could be connected with. Daphne found herself with a dilemma. She didn't think she would feel comfortable jumping rope, but to point out why could be mortifying for Trev. The situation had to be handled delicately. The he pulled out a second one, and she breathed a sigh of relief. Where the thought of jumping alone in front of him had seemed mortifying, jumping alongside him seemed much more reasonable. Lucky for me there was two ropes. Daphne accepted the rope from his hand. "All right," she said slowly but with a smile. "We'll see how this goes. But next time I get to teach you the West Street swing." She lowered her hands to her sides and tried her best to mimic his positioning and style. She looked a little apprehensive as he threw her the rope. Trev wasn't certain why, though; it was a simple exercise. Perhaps she'd never skipped rope before, though it was one of the games that even most skaa children had access to play. But it shouldn't be a problem, even if for some reason she hadn't, she could learn this easily. "That's only if all this goes badly, yeah?" he said with a grin. "If it goes well, I'm off the hook?" He moved to stand next to her, leaving plenty of space for them both to work. "Keep your elbows in at your sides when you skip," he explained as he began to jog in place, the rope whirring rhythmically in a circle, "and rotate your wrists, not your arms. Try to keep relaxed and breathe through your nose. We'll do this in two-minute rounds, with a quick breather in between." Daphne nodded, and set her rope spinning, trying her best to mimic Trev's graceful motions. It was difficult at first to think of everything (the rope, the movements, her breathing) at once. After a few moments, she began to fall into a rhythm and it became more natural for her. As she neared the end of the first two minutes, the warmth of motion and life was spreading through her body, and she was beginning to perspire lightly. It felt good to suddenly feel so alive! She'd kept silent while they were skipping to focus on her breathing, but when they stopped she held her rope in one hand and ran her finger through her hair to push loose strands away from her face. "That wasn't bad at all," she said, feeling her smile brighten. The quick period of exertion and woken up her deadened limbs, and for the first time in days she felt energetic and... happy. "I'm not sure it's as effective as the swing though. I think we'll be forced to experiment." Daphne's entire attitude had changed with the start of their exercises; her eyes lit up with a fresh interest and even enthusiasm, and her smile grew. The difference from the almost-timidity and hesitation she had shown earlier was striking. Once she had decided to do something, she plainly intended to go through with a will. It would be interesting to have her as a student. They paused for a few moments after Trev had counted a couple of minutes, and she threatened him with dancing again. "Now just a moment. I thought the swing was the penalty for a failure, and there has been no failure, or are you bored already?" he protested, though he let his smile give away that he had no real objections to the proposal. He enjoyed dancing, and in point of fact it would be a perfectly acceptable warm-up exercise, if a little unconventional. There was no reason not to. "But if you're serious, I know the swing, and I suppose it works as well as skipping-rope." "You decided it would be a punishment or last resort. I never agreed to anything." Without thinking, Daphne moved to bat his arm playfully before she realized what she was doing. When she did, she quickly moved her hand through her hair again to disguise the motion. She hoped he hadn't noticed her slip. I've been working too much lately she realized. It was too easy to fall into habit when she was around men. When she was on the streets, she had the be able to be be merry and flirtatious to attract customers. Here, with a leader of the rebellion, she would only look like a fool. If he realized what she was doing. If he didn't then she could get herself into even more trouble. While Trev was obviously intelligent and observant, he also seemed kind with a hint of the gentleman in him. Daphne had learned the hard way how easy it was to lead on similar men. She couldn't afford to go down that road again. It led only to pain. She was a prostitute, married to her work. No real man could ever find happiness with her. "You know the swing do you?" she said quickly, hoping to keep going with current subject before Trev had time to notice her slip. "Well, then," she said, dropping her rope and taking a few steps to the side, "Let's see what you can do." Daphne forced herself to smile, not wanting her melancholy to spoil the moment. Daintily, she lowered her hands to her sides and assumed the proper stance to begin the dance, and lifted her skirts slightly so her feet were in view and would be free to move. She took a deep breath, reveling in the stillness for a moment. Then, her feet burst into motion. Lilting from side to side slightly, Daphne executed a short routine of complicated steps and turns, her feet moving faster and faster until she stepped to the side and let her skirt fall, holding out her hand for Trev to take. "Well..." Daphne said, catching her breath. Trev tensed very slightly when she raised her hand, though he was aware it was a play-fighting move. Still, the instinct was there to deflect the perceived strike away, he simply kept it subdued. Oddly, she stopped the action only half-formed and brushed her hair back again, instead. That particular gesture seemed to be something she did as a sign of discomfort. She had done it earlier, when she first came into the room and unexpectedly found him there. It was a deliberate, unnecessary motion, her hair was not in disarray right now. The lighthearted moment had disappeared. She was still smiling, though, and she rapidly put down her rope and moved away, taking up the position for the dance. Trev kept his observations to himself, and moved around to stand opposite her, mirroring her stance with his left foot forward. Standing like this, it was particularly noticeable that she was a good four inches taller than he was. He was a short man, though; that happened a lot, and it didn't make much of a difference in a dance. She sprang into motion in front of him, dancing to some inaudible music in her head; he watched to catch the beat, then whistled along with her while she danced. Cobbler's Soup was a cheerful nonsense-tune that had a tendency to get stuck in the head. Trev figured that was a useful property just now. When she wheeled back to him, holding out her hand, he left off whistling, caught both her hands up in open position and they took off together this time. Trev spun Daphne in and out, kicking his heels in synchrony with her. He went easy at first, keeping the tempo down to something more reasonable than the pace she'd set during her shine move. Then he grinned at her and started to speed things up. She had set him a challenge? She would get one. Daphne laughed delightedly as Trev began to pick up his tempo. She'd been worried at first she had set the pace too quickly for him when he had begun the dance at a slower tempo. "Master Trevelan," she said, trying to keep the breathlessness from her voice as their feet continued to whirl, "I hope you aren't toying with me. If you are in the mood for wasting time, I'm sure we could just jump rope again." The next time she faced him, she gave him a quick wink to take any unintended bite out of her words. "You challenged me," he shook his head smiling as he slowed them to a halt and let go of her hands, "but don't worry. We're going to do something practical next. Can't dance the day away after all." "So." He stretched as he spoke, expecting her to follow his example, "A few things before we start. We're going to move slow, starting from the ground up. I'm going to teach you how to stand in a fight, how to walk, and how to fall before you ever get around to hitting things. There'll be some strange stuff, but there's a point to it all, I promise." He'd seen people get frustrated with this; after all, they'd learnt to walk when they were two years old and didn't want to have to do it all over again. Daphne seemed like she had better sense, though. "Alright." Trev came around to stand in front of her, "Feet shoulder-width apart. You want strength in your stance so that I can't just shove you over easily. Don't let your knees lock up, bend them just a little and sink down into it. Weight on your back leg, you'll be more stable that way." Edited by Borborygmus, 09 December 2012 - 12:18 AM.